What is Build by Choice? Your subscription to Academic Video Online includes an automatic annual benefit whereby your library can select individual video titles within the collection for perpetual rights ownership at no additional cost. The number of titles your library can select for ownership is based upon your current annual subscription cost. 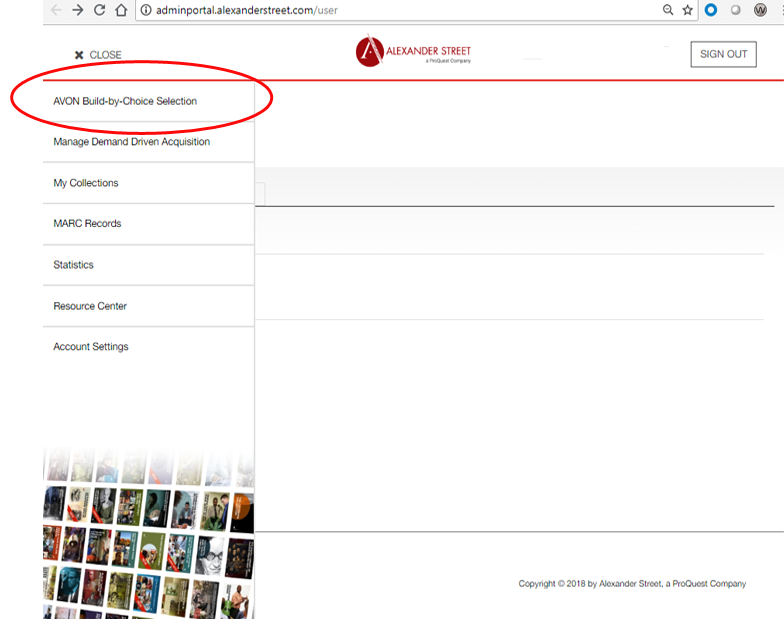 You can choose from over 50,000 titles and find those available in this program through your admin portal. These titles have been visible to your users as part of your subscription, and COUNTER usage data is available at the title level to help you choose which titles to keep in perpetuity. What does "Perpetual Ownership" really mean? By taking advantage of this subscriber benefit, your library will retain access to as well as the rights to the videos you select, even if at some point in the future you choose to no longer subscribe to the overall collection. What you are doing today is securing the rights to keep these titles accessible to your users via your library in perpetuity. How often can I select titles for ownership? This is an annual benefit – the longer you subscribe, the more titles you can keep. Also, because this benefit is based on your previous year subscription, you can select titles for ownership even if you choose not to renew your annual subscription to the collection. Selections are made in the calendar year following your subscription start date and must be completed by 12/31 of that calendar year. 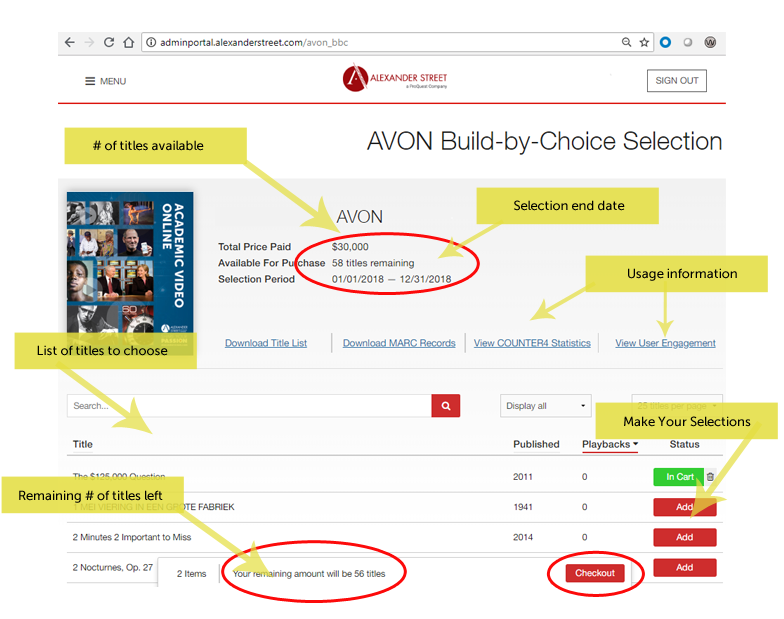 Click “AVON Build-by-Choice Selection” from the menu in the upper left. Checkout and enjoy your newly acquired titles. Once we receive your title selection form, you will receive an email confirmation that your selections have been set up for perpetual access. We now offer COUNTER 4-compliant reports, SUSHI-enabled reports, and customized reports you can export by title, subject, and collection. This is the only site to report usage on the new interface. To access the new Administrative Portal, go to http://admin.alexanderstreet.com. Download a printable quick reference guide on how to use the new portal. If you already have an account on the existing stats website, you may use those log in credentials on this site. If you need to create an account on the new Administrative portal, please contact us at support@alexanderstreet.com. Thank you for being an Academic Video Online subscriber!